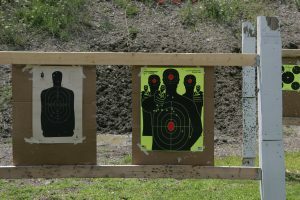 Here at Buffalo Range Shooting Park, we offer a variety of ranges for your firearms and for your enjoyment. We have The Pit, a Pistol Range, 50 and 100 yard Rifle Ranges, a Trap Range and a Training Range. We offer a diverse variety of ranges for you and your family to enjoy and that’s is what makes us stand out from other shooting ranges in Illinois! Don’t forget we have gun rentals and we sell ammunition as well. So if you’re looking for an enjoyable time at one of our many range options, then Buffalo Range is the shooting range for you in Illinois. We have affordable pricing and provide discounts for veterans and individuals on active duty. So give us a call today at (815) 433-2471 for more information. The Pit is a large open range where you have target assessment from 40 to 75 yards out. Rapid fire is allowed, as long as it is under control. At our Pistol Range, we provide 18 lanes with a variety of lengths. We have 3 lanes for 5 yard targets, 9 lanes for 10 yard targets and 6 lanes at 15 yards. The Pistol Range also offers an enclosed building to shoot from. Our Rifle Ranges consist of 17 lanes at 50 yard lengths and 28 covered lanes at 100 yard lengths. We have 7 spaces or lanes for trap shooting. The trap area is covered to offer protection from the elements and our throwers are capable of launching multiple targets at a time, increasing the challenge! At last we have the Training Range. This is a great opportunity to “run and gun.” With cover positions, multiple targets and the transitioning between pistol and rifle throughout the range, really allows you to apply many skills. As you can see, we offer a variety of ranges for you to hone your skills and for you to enjoy, for a day a few hours or an entire weekend. If you haven’t found yourself a shooting range in Illinois, contact us or call us today at (815) 433-2471 to experience all we have to offer at Buffalo Range Shooting Park. Have a question? Email us by completing the form below. Get social. Connect with us on social media.